A Whole Lot of Thanks…..
Thanksgiving is a great holiday….it’s a reminder to give thanks for all aspects of your life while gorging on good eats. 🙂 It was one of my favorite holidays growing up–waking up to the delicious aromas of my mom’s cooking in the kitchen. With all of our extended families congregating at my folks’ house with all of their dishes, Turkey Day was an epic eat-fest from morning to late night. This year, Turkey Day consisted of a small party of three: me, the bf, and older sis (and our pup Bella!). And although we were only cooking dinner for 3–it was no excuse for us not to GO BIG to truly celebrate our Thanks and loved ones. 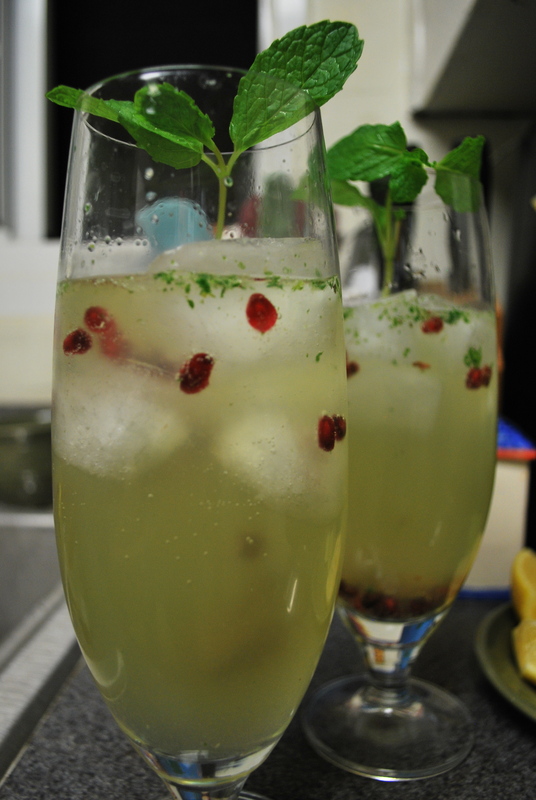 Pomegranate Lime Mojitos © Photo rights reserved. Pacific Oysters © Photo rights reserved. 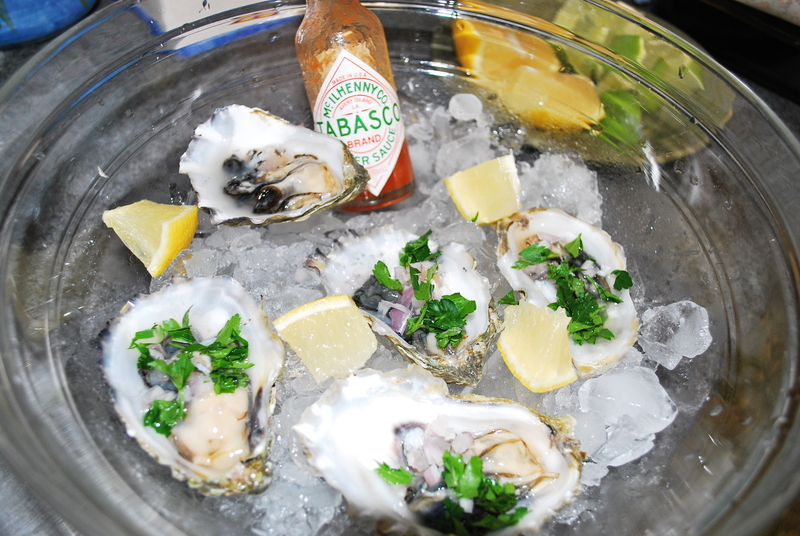 Freshly shucked Pacific Oysters on the half shell. (Sorry for the bright flash–I was having issues!) Since my sister’s dressing called for oysters, she opted to get a few more than the recipe listed so we could enjoy them fresh. Earlier this year, I threw a surprise birthday party for the bf at Tomales Bay Oyster Company. After shucking over 80 or so oysters, we sure got the technique down. 🙂 We enjoyed these simply with diced shallots, fresh Italian parsley, a squeeze of lemon, and a ton of Tabasco sauce. Decadence Tower © Photo rights reserved. Boccalone's Oyster-Sausage Dressing © Photo rights reserved. The sis found a recipe for Boccalone‘s Oyster-Sausage Dressing. Omitting the lard, this recipe was fairly easy and does not contain eggs or any dairy. 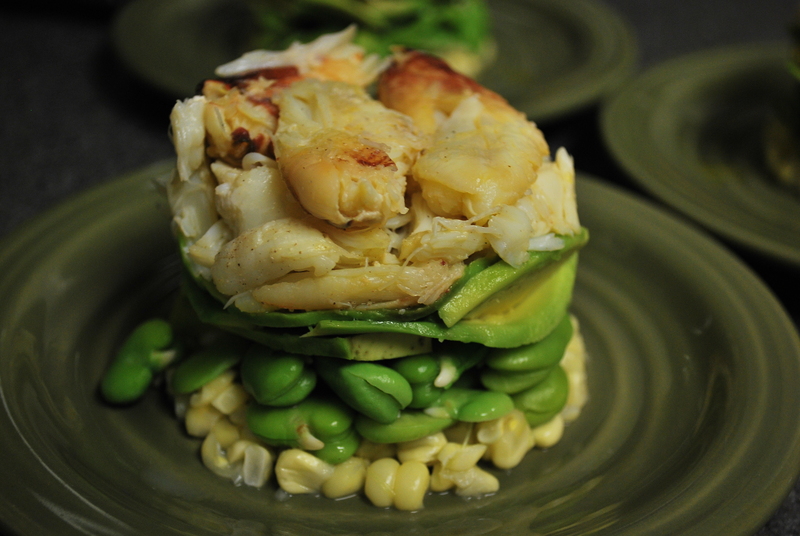 We think that perhaps the oysters (freshly shucked) added moisture to this yummy side dish. Potato Crimini Gratin © Photo rights reserved. We’re in charge of bringing our Roasted Garlic Mashed Potatoes to an upcoming Friends Thanksgiving Dinner. To change things up, I wanted to make a different potato side dish. I found Chef Bruce Aidells recipe of the Potato Mushroom Gratin. 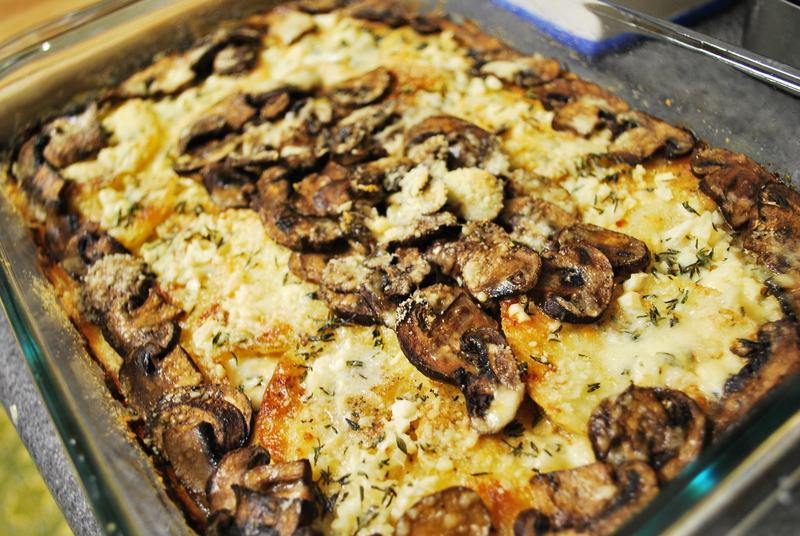 The recipe is super easy and the gratin turned out yummy! I made it the night before and warmed it up prior to dinner. 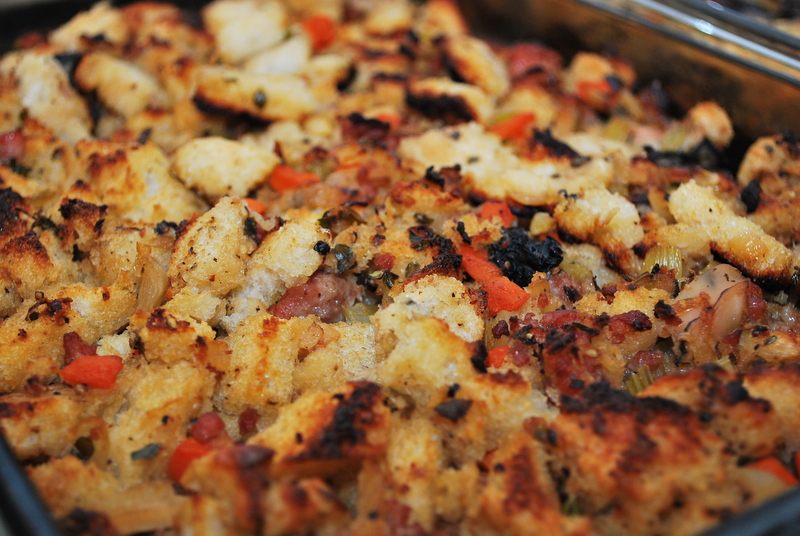 The parmesan added such a delicious earthy and “nutty” flavor to the creamy gratin. YUM! Herb-Butter Turkey © Photo rights reserved. 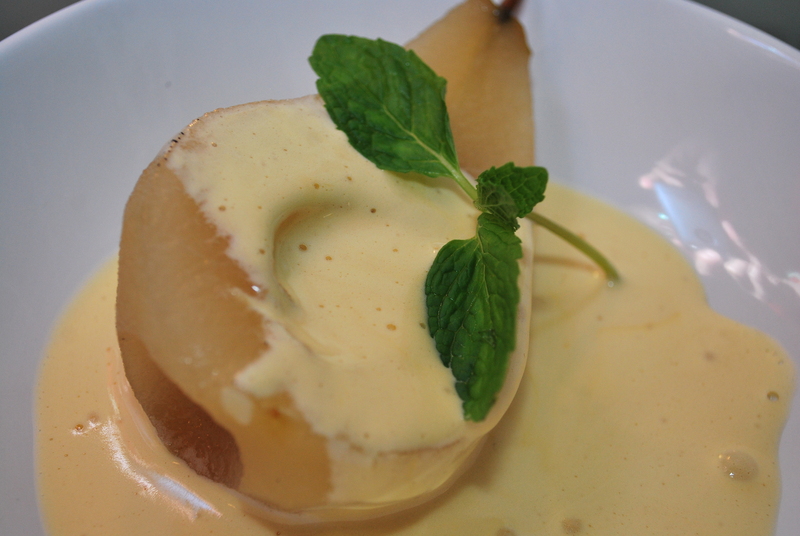 Poached Bosc Pears with Zabaglione Sauce © Photo rights reserved. I wanted something “Autumnal” for dessert and the sis suggested Poached Pears with Zabaglione. We “winged” the poaching liquid, throwing a bit of this and a bit of that into the pot……cinnamon sticks, cloves, etc. The lightness of the pear matched the rich, creamy Zabaglione sauce so well! It was a perfect “lighter” dessert to end our decadent Thanksgiving dinner. Needless to say, we thorougly enjoyed our day cooking together and feasting on our dishes. In my opinion, there are few better ways to enjoy time with loved ones than in the kitchen. Truly, I have a lot to be thankful for. So to you all–HAPPY THANKSGIVING!!!!!! Previous Post The Barefoot Contessa Does It Again…. Delicious meal! Happy Thanksgiving cousin! Gosh that was good. Hmmmm should we start thinking about next years’ menu? Thanks so much for checking out my blog! 🙂 Happy Holidays! Fantastic looking menu! Sounds nearly impossible if it weren’t for anyone else but you blogging about it. 😉 Looking forward to seeing the cupcakes you make with the remaining poached pears too! my stomach is growling once again..yum-O!!! i’m so sad i wasn’t there to enjoy the feast! can we recreate some of those dishes for xmas or, heck, just whenever you guys come down for another visit?! 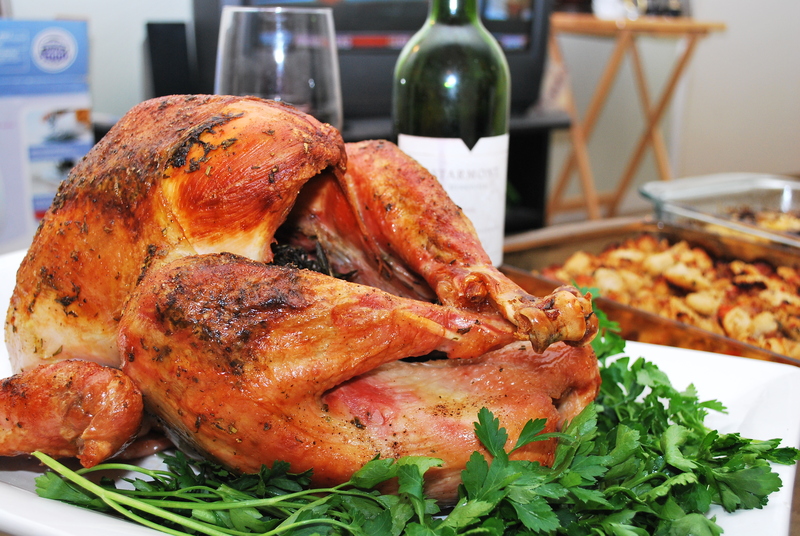 i especially want to try the oyster stuffing dish, the tower, and the turkey. bak bak!